It has now been over a week since The Guardian, and sister paper The Observer, both rebranded. Perhaps more saliently, they also reshaped themselves, moving from the unique “Berliner” format to a tabloid. Now in some respects I feel unusual these days in still buying a physical printed paper. These are some of the responses you get when people see you with a newspaper. It’s true that my station has a well-stocked bin of Metros in the morning, and I can easily pick up an Evening Standard on the way home. That’s before you consider editions of Time Out, NME, Stylist, Shortlist or a load more freebies in central London. I have a phone and a tablet, so I can get the news on that. And it’s also true that sometimes when I get to the paper, even in the morning, I find I’ve already read the article on line the day before. Sometimes with arts material it can be several days before (The Guardian seem to put its book coverage up around Thursday ahead of the Saturday “Review” supplement). But printed papers are great for lots of reasons. You can get them all over the place, and you can read them anywhere. They don’t go flat, and they (can) have powerful design. There’s also the editorial nourishment. When presented with a digital list of stories, we tend to click on the things we’re interested in. Actually these days, we probably don’t even go to a homepage (although with Facebook’s recent announcement about downplaying news in people’s feeds, we may see a greater importance of these), but tend to get to stories via links shared in social media. I buy The Guardian because it has strong editorial. Much of the news in free newspapers is bland agency copy. Metro is never going to invest in major investigations like The Paradise Papers for example. A week in, my first impressions of the paper is that it looks an awful lot like The Independent did once it had gone tabloid. Not so much in content as in style. It seems slightly harder to differentiate papers in a tabloid world than it is in a broadsheet one. The new version of the paper has obviously had a major redesign, beyond simply shrinking the paper, with a new masthead and new fonts. The Guardian has always been more likely to go through redesigns than other papers. When The Times went tabloid, it was more about how they could continue to use the same fonts and stylistic devices in the “compact” format. The Telegraph has not really had a major redesign at all. With the FT, it is now alone as a broadsheet (The Sunday Times notwithstanding). Of course, it is a hollow remnant of what it once was – a bit like one of those new-builds where they’re required to keep the front facade. There’s a strapline above the masthead on the first day said that the paper had two pullout sections. Originally I thought that these might be G2 and Sport as previously. But Sport has returned to the back of the paper, which is probably a good place for it to be, since in truth, some days it really felt as though it was being padded out to fill even 8 pages. G2 is a pullout as before, but the second pullout is Journal – essentially the opinion parts of the middle of the paper, alongside obituaries, and the puzzles that used to form the back of the main Berliner section of the paper. Indeed the back pages of both pullout sections contain puzzles now. Having Journal as a pullout does mean that one of my favourite features of the Berliner format paper has been retained – Eyewitness, which acts as a double-page spread for a featured photo. Seeing photos printed big is another reason that printed newspapers remain superior. 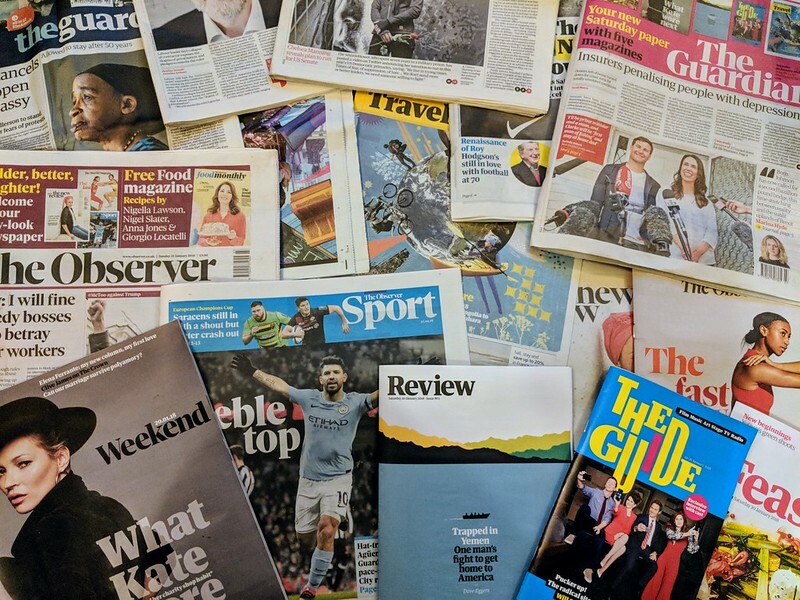 The new tabloid Guardian is now printed by Mirror Group presses – part of the cost savings that the shrinking of the paper is designed to help with. I was a little worried that the printing quality might deteriorate, but in fact it’s perfectly fine. I’m less certain about the new masthead’s design, but as with previous iterations, it’ll no doubt grow on me. All lowercase does feel very “90s”, and the return to proper capitalisation is to be admired. But the change of font, masthead, paper size and overall design means that everything has changed at once. This isn’t a half-hearted measure. What you can’t help noticing is the number of advertisements in the paper – or lack of them. Print advertising continues to decline across the industry as digital advertising cleans up. While I think print always did well, over-achieving for its readership, advertising was and remains a vital part of the mix for a publisher, and those advertising declines must hurt. Diamond Geezer notes that fewer “newsagents” carry print at all, becoming convenience stores rather than purveyors of printed material. Friday’s paper is always a late week highlight since it carries film and music reviews. The revamped G2 still carries these but somehow there feel, at least in the first week, to be fewer of them. Not so much films as music. Previously you could expect perhaps a couple of pages of pop/rock reviews and then a page of other music including classical, jazz and, well, non-pop music. There seems less of that now, and I’m going to miss that. I still like reading printed music reviews, and while I know that I can find music blogs to help, they often feel like they serve certain niches. I want to read about a folk release alongside the big mainstream pop release, and a new classical album. Saturday’s Guardian was always my favourite day of the week, even if I shed certain sections as quickly as I could. I barely ever opened the Family section, while the Travel section would only grab my attention if there was somewhere I was interested about on the cover. The Cook section would always get recycled unread. I’d flick through the magazine, and get stuck into The Guide. But key for me were a chunky main section, a good sport supplement and most important of all, the Review section. The new-look paper has been rejigged a bit. Cook becomes Feast and is printed on higher quality paper. They expect people to hang onto these as they’re even selling boxes to collect them in! I must admit that it does look good, and they’ve poached Grace Dent as their restaurant critic, and she’s always worth a read. Sport is still in place, and the main section of the paper seems to be broadly unchanged. None of the features I liked to read seem to have gone anywhere. And I’m especially pleased that although the Review section has had a massive redesign, it’s importance remains. It’s now printed on high quality paper and although it too may have slimmed a tiny amount, it treats its subject properly and is probably the best newspaper book section. The Observer also has a new masthead, making it clear that it’s the Sunday edition of The Guardian rather than a separate entity. The main section stays largely in place, while sport is as good as ever, even if it has an unhealthily skewed belief in the importance of rugby union. The New Review is largely as it was before, just rejigged and resized. And the magazine remains largely unchanged, in that I rarely even bother to open it up (although it does at least review the odd bicycle alongside cars in their transport bit). Also notable in the rebranding has been putting the new branding into all The Guardian’s various digital assets. That seemed to happen very smoothly even though you know it must have been a complex procedure. Overall, I’m pretty happy with things. I’d like the new font to be a little more different to those used by The Times and The Independent (when it was still being published), and it’ll be interesting to see if they ever succumb to the temptation The Indie had to keep using the front page to cover single issues. What’s really key about all of this is that the paper stays on track in reducing its losses and gets to a break-even point so that the money in the coffers there to support the paper doesn’t run down.